As you head east from San José on the Guápiles Highway the Zurquí tunnel transports you from the modern world into the rainforest and cloud forest of Braulio Carrillo National Park. The two most important features of Braulio Carrillo National Park are ironically opposed in some ways. One is the huge expanse of virgin forest, and the other is the highway that gives easy access. 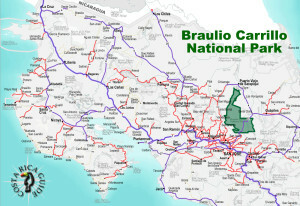 It is difficult at first from a conservation perspective to consider a major highway an attraction, but in the case of Braulio Carrillo National Park it clearly is. The highway is the reason that this area was protected (see established). Even without leaving your car, the views are breathtaking, and one can’t help but feel moved to try to conserve areas like this after traveling through. It’s one of the busiest highways in Costa Rica, but if you walk a hundred yards to either side you are enveloped in another time. 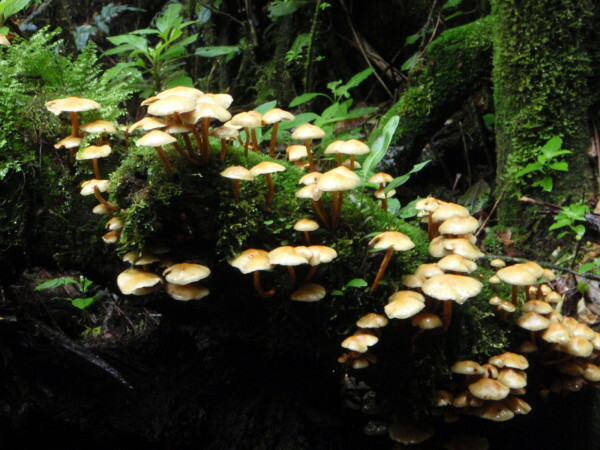 Inhabitants include more than 500 species of birds including resplendent quetzals, bare-necked umbrella bird, snowcap, brown-billed scythe bill, black-crowned antpitta, golden-browed chlorophonia, flame-throated warblers, long-tailed silky-flycatchers, yellow-eared toucanet, and latticed-tailed trogon. On the lower Caribbean slopes, tanagers and hummingbirds are particularly easy to spot. Over 150 species of mammals including howler and white faced capuchin monkeys, tapirs, Deppe’s squirrel, white-nosed coati, northern tamandua, jaguars, white-tailed deer, ocelots, pacas, raccoons, and peccaries also invite you to explore their home in Costa Rica. It’s bisected by one of the busiest highways in Costa Rica, but if you walk a hundred yards to either side you are enveloped in another time. The hiking trails are the main event in Braulio Carrillo. From the short paths to overlooks and waterfalls to a trail that winds 32 miles (60 km) and drops nearly 10,000 feet (3,000 meters) from Barva to La Selva, this park has something for everyone. 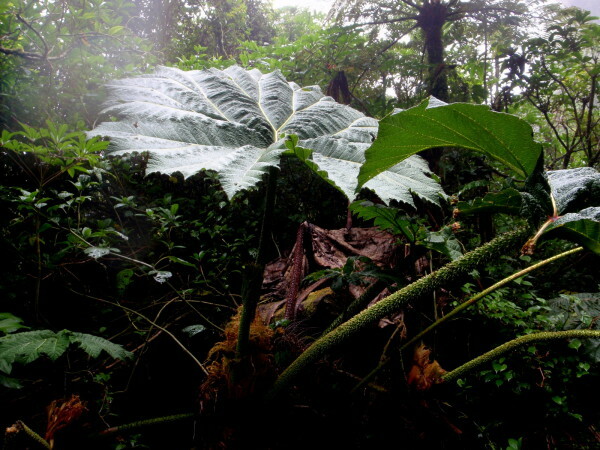 One of the unique walking opportunities in Braulio Carrillo is the chance to contrast the flora and fauna at different elevations. You can easily walk for an hour in the high elevation rainforest surrounding the Zurquí station, drive on to the Puesto Carrillo station for another hours walk 3,200 feet (1,000 meters) lower, and be on the beach in Cahuita for the Sunset. Puesto Carillo is the trail head for the Los Botarramas (1 mile, 1.6 km) and La Botella (1,7 mile, 2.8 km) paths. Across the highway from the the Zurquí station is the short Capulin loop trail. Back down the road, south of the tunnel is a 0.6 mile (1 km) trail to a mirador). 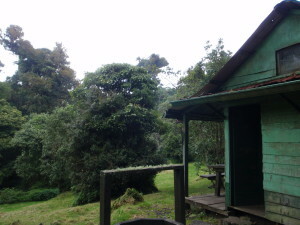 Puesto Barva Station is the starting point to climb to the small lake in the crater of the extinct volcán Barva (1 mile 1.6 km). From the summit you can either loop back to the south east to the village of Porrosatí, or if you have a permit, guide and 4 days of food, you can continue north down a lava flow that was reforested millennia ago to La Selva. The rainforest Aerial tram is on the Eastern flank of Braulio Carrillo National Park. 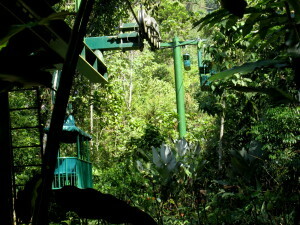 This is an open gondola that takes you on a two level tour of the rainforest canopy. It traverses a valley and climbs a small mountain. On the way up you ride a few meters off the ground in the understory and lower canopy, on the return trip the ride is through the treetops as much as fifty meters (170 feet) off the ground. Each gondola carries up to four passengers and a guide, and all of the guides are equipped with walkie-talkies so if one spots a sloth they all know to point it out when you pass by. There are also a few kilometers of excellent hiking trails and guides on these walks are included with your admission and tram ride. Whenever you go to this park you will find that the vast majority of people are just passing through. The trails are never crowded, but the highway nearly always is. In contrast to most of the roads in Costa Rica, traffic on highway 32 flows with relatively little congestion due to the passing lanes provided on the uphill side. Weather is not a major consideration because it’s always wet here (March and April are slightly drier). You can expect afternoon shower year round, and should always be ready for a downpour. 157 to 315 inches (4,000 to 8,000 mm) of rainfall annually. Temperatures vary widely with elevation from average temperatures of around 79 °F (26 °C) on the lower east slopes to below freezing nights on the peaks and ridges. Driest in March and April while afternoon showers are the norm May through November.Use the drop down menu to select any month of the year for a summary of the typical rainfall and weather patterns. The park protects 117,300 acres (47,500 hectares, 183 square miles, 140 times the size of central park NYC, 4/10ths the size of Rocky Mountain National Park Colorado) and elevations range from 36 to 2900 meters (118 to 9514 feet). 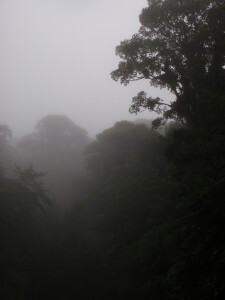 The habitats represented in Braulio Carrillo are cloud forest, margin/edge, regenerating tropical rainforest-lowland and tropical rainforest-upland. Braulio Carrillo is named after the third president of Costa Rica who proposed the Guápiles Highway from San José to the Caribbean in the early 1800’s to allow Pacific slope coffee growers to ship to Europe without circling around South America. Over 150 years later when construction began, environmentalists were concerned that easy access would lead to deforestation. They used the value of the region as a watershed to leverage the establishing the National Park in 1978. The original area has come to be know the Zurquí sector since the addition of the 31,400 acre (12,700 hectare) northern Barva sector in 1986.